One summer’s day, ten years ago, I met Alf Lloyd. We were at a reunion party for my husband’s family of Eldridge’s. Like me, he’d married in. I asked about his life and he explained that he’d been a foundling, raised by the Foundling Hospital. Born in 1917, he presumed he was the result of a liaison between his mum and a soldier in the First World War. At fourteen, he’d joined the army: another institution and another sort of home. His fellow soldiers were a mixed lot. No-one ever asked about another’s family. He was safe. Later he met Jean Eldridge. I sensed she was the pillar in his life, the person who represented all that he’d never had: wife, lover, sister, mother, cousin, aunt – all rolled in to one. They had two boys and a girl – their own proper family. When 26 Pairs of Eyes launched in conjunction with the Foundling Museum, I remembered Alf. This felt like the project for me. 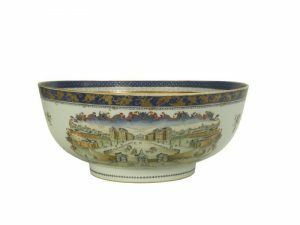 My object is the porcelain famille rose ‘London’ Punchbowl. Famille rose describes Chinese porcelain that is characterised by decoration painted in opaque overglaze rose colours. My initial thoughts were: what the heck’s this got to do with the Foundling Museum? Also: it’s the perfect size in which to bathe a new born babe. It is a rare piece, elegant and beautifully painted both inside and out. It features images of the Vauxhall Pleasure Gardens and the Foundling Hospital – the former a successful business, the latter a charitable institution. They shared many connections: both enjoyed aristocratic and artistic patronage not least through supporters like Handel and Hogarth. The image of Vauxhall Pleasure Gardens captures the hustle and bustle of people, in full evening dress, gathered for an evening’s musical entertainment played by an orchestra in the Rotunda. What stands out in the Foundling Hospital’s illustration is not the few people but the architecturally symmetrical and austere building standing far back behind a high wall and gates. As if to soften the severity of this scene, Meissen-style floral sprays are painted between the images. Why, I wondered, would anyone want to put an image of the Foundling Hospital on a punchbowl? It was historically interesting but, to be frank, it put the dampeners on an object that was made for a celebratory drink. That in itself raised questions. Who would have commissioned the bowl? And for what purpose? To raise funds for the Hospital? And if so, why show the Vauxhall Pleasure Gardens? Why make a punchbowl? Lots of questions but, sadly, there are few answers. We do know that the punchbowl was created in the mid eighteenth century, in Jingdezhen, China, for export. We also know that the two main illustrations appear in the Twelve Views in and about London of Public Buildings &c, published by the Bowles family and advertised in their 1768 catalogue. Whether the pairing was specified in the original commission, or whether the Chinese manufacturers selected prints at random – is not known. There is another link – a poignant one – between the Gardens and the Hospital. In the 1740s a mother entering her baby to the Hospital, left a 1737 copper season ticket to the Gardens as an identifying token. Well, of course, there’s more. There’s speculation. It’s possible that several identical punchbowls were made. (Two others have been recorded.) They could have been high status gifts for similarly high status people – perhaps a committee of patrons involved in the 1784 Commemoration of Handel’s birth. There’s not much more to say. The punchbowl is, like so many of the 25,000 children who passed through the Hospital, an enigma. That’s what I wanted to capture in the accompanying poem. I conflated the lost background of both the punchbowl and a baby girl, Rose, treating each as a sentient being. We all want to know where we came from, from whom we came – and to be loved. This bowl has been loved and treasured. Why else would it have survived? The donors – Catherine, Antonia and Lucy Newton – presented it to the Foundling Museum in memory of their beloved mother, Jan, a foundling. Perhaps the bowl finally found its true home. As for Alf Lloyd, he died in 2013. Shortly after, his family approached Coram (the new name for the Foundling Hospital charity) for information on his background. He was born Alfred Jones, son of a 23 year old Welsh woman. She was the daughter of a vicar based near Pwllheli. The Hospital kept Alf’s Christian name but gave him a new surname. Whether its Welsh basis was deliberate, isn’t known. Alf was right: his mother had an affair with a soldier. She worked for the army in London and Shrewsbury, and was in the latter town when she met her boyfriend. Later that year she joined the WAAC and was posted to France. Sometime after, she was hospitalised and sent back to England to give birth. She was, apparently, ignorant of her condition. It turned out that the soldier-friend had given her a false name. Though the Foundling Hospital offered to find him, Alf’s maternal grandfather stopped any investigation. Alf’s birth mother died in the 1970s. Like all foundlings, Alf was fostered for his first five years. His was a loving family and they remained in touch throughout his life. Alf served in the army from 1931-1946. During World War II he fought in Burma and Europe. In 1944 he was in the first line of paratroopers at the Battle of Arnhem. He was shot and taken prisoner, spending the rest of the war in Stalag XI B, in north-west Germany. After the war he worked for the Post Office Savings Bank, eventually moving to British Telecom. An intelligent, musical, well-read and knowledgeable man, he rarely talked about his foundling background. I’d been lucky that summer’s day. And a monument to mistakes. At whose hands was I made and for whom? A token of profound gratitude.